1R. Martínez (e-mail: ricardo.martinez@cttc.es), A. Mayoral, R. Vilalta, R. Casellas, and R. Muñoz are with the Centre Tecnològic de Telecomunicacions de Catalunya (CTTC), Barcelona, Spain. 2S. Pachnicke is with Kiel University (CAU), Kiel, Germany. 3T. 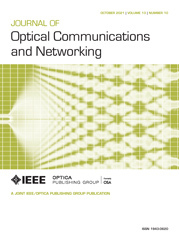 Szyrkowiec and A. Autenrieth are with ADVA Optical Networking SE, Martinsried, Germany. Future 5G networks will bring important challenges to network operators, such as the traffic load increase mainly due to the proliferation of mobile broadband communications. This will force mobile network operators (MNOs) redesigning and investing in their infrastructures [e.g., new equipment for radio access network (RAN), backhaul] to cope with such data growth. Aiming at lowering both capital expenditures and operational expenditures, current networking trends on network virtualization, software-defined networking (SDN), and network function virtualization (NFV) provide an appealing scenario to flexibly deal with the increase in traffic for MNOs without overdimensioning the deployed network resources. To this end, we rely on an implemented SDN/NFV orchestrator that automatically serves MNO capacity requests by computing and allocating virtual backhaul tenants. Such backhaul tenants are built over a common physical aggregation network, formed by heterogeneous technologies (e.g., packet and optical) that may be owned by different infrastructure providers. MNO RAN traffic is transported toward a mobile core network [i.e., evolved packet core (EPC)], where required backhaul resources are tailored to the capacity needs. The EPC functions are virtualized within the cloud (vEPC), leveraging the NFV advantages. This increases MNO flexibility where cloud resources are instantiated according to EPC needs. The goal of the SDN/NFV orchestrator is to jointly allocate both network and cloud resources, deploying virtual backhaul tenants and vEPC instances for a number of MNOs with different service and capacity requirements. Each MNO’s backhaul is isolated and controlled independently via a virtualized SDN (vSDN) controller deployed in the cloud. The SDN/NFV orchestrator architecture is detailed and experimentally validated in a setup provided by the Centre Tecnològic de Telecomunicacions de Catalunya and ADVA Optical Networking. Specifically, upon an MNO request, the orchestrator instantiates the vEPC and vSDN functions in the cloud and then composes the MNO’s backhaul tenant over a multilayer (packet and optical) aggregation network.